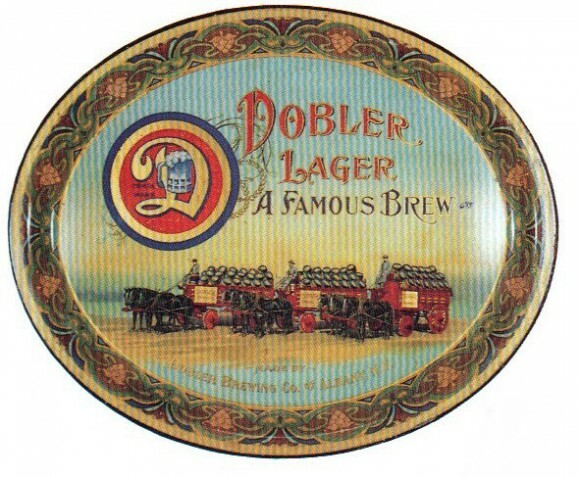 Serving Tray for A Famous Brew, Dobler Lager, from The Dobler Brewing Company out of Albany, New York. The picture is a depiction of three horse and carriages carrying the company’s brew. This tray is a 18.5″ x 15.25″ oval that was produced pre-prohibition by the Shonk Company of Chicago. There is a smaller size of this tray that is a 16.5″ x 13.75″ oval as well. This tray has great detail in the rim and the large D logo is similarly intricate. A great tray overall!